OneMain Financial has been a trusted name in personal finance for over a century. It’s an industry that has seen increasing competition in recent years, so in 2017 the company decided to focus their marketing efforts on the thing that truly sets them apart from the rest – one-to-one personal relationships. This brand makeover included a fresh new look, lighter tone and more conversational messaging, all with a “human” approach. And they came to Orange Element for guidance on rolling out this new brand across multiple channels, with an emphasis on lending with humanity—whether it’s in person, on the phone, in the branches or online. Turns out, the job was more than just a simple facelift. 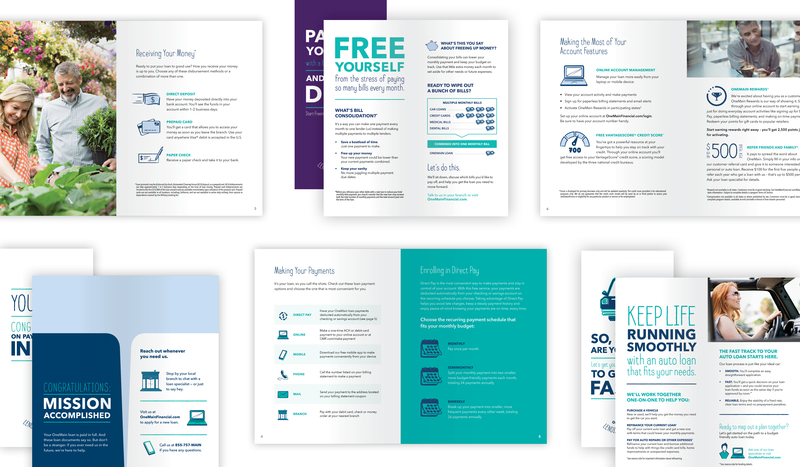 Our designers and writers had to work together to find creative ways to present what’s traditionally considered “stuffy” finance speak in a casual, welcoming, lighthearted format – aligning with OneMain’s new “Lending Done Human” brand promise. But at the same time, it was imperative that we relay this often-complex information clearly and accurately. After an audit of their existing materials, we eliminated some pieces that were no longer needed and consolidated others for efficiency. In redesigning the materials, we incorporated custom icons, infographics, bold headlines and conversational copy to present loan products in an approachable way. The result was a suite of attention-grabbing collateral pieces that served as highly informative educational tools – including product brochures, tabletop displays, take-home folders and a quick-reference guide. To ensure that this new look and tone is consistently implemented across all OneMain marketing pieces, we worked closely with multiple internal teams to craft a comprehensive set of brand guidelines. This new “brand book” serves as a resource for anyone who communicates on behalf of the company. Step into any of OneMain’s over 1,600 branches nationwide and you’ll see the colorful hues and catchy headlines of its exciting new brand across materials and signage. Customers now have easy-to-follow, engaging and friendly materials educating them on the products and services OneMain has to offer. This new branding not only makes OneMain stand out in a crowded field, it takes the company back to what has always made it unique – a compassionate, understanding, human approach to lending that’s unmatched in the industry. We wanted the humanity that we bring to the lending process reflected in our branch materials across the country—and Orange Element more than delivered. From initial kickoff to final rollout, the Orange Element team made our brand, budget and scheduling goals their top priority. And their attention to detail shows in all brochures, folders and signage now displayed in our branches.